Legacy Library: Dr. Martin Luther King, Jr.
MartinLutherKingJr is a Legacy Library. Legacy libraries are the personal libraries of famous readers, entered by LibraryThing members from the Legacy Libraries group. » Dr. Martin Luther King, Jr.'s catalog. 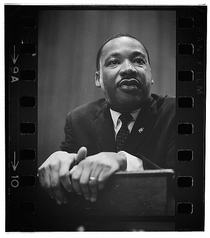 » Dr. Martin Luther King, Jr.'s legacy profile. MartinLutherKingJr is also an author. » See Martin Luther King's author page. About meDr. Martin Luther King, Jr. (15 January 1929–4 April 1968), Baptist minister and leader in the American civil rights movement. About my libraryThe books included here are those in the Morehouse College Martin Luther King Jr. Collection, held at the Archives Research Center of the Robert W. Woodruff Library. See the Book Listing for information about accessing the collection. The books reportedly contain Dr. King's handwritten annotations, though these are not noted in the listing. Real nameDr. Martin Luther King, Jr. The Review of Metaphysics by Catholic University of America. School of Philosophy. Philosophy Education Society. Report to the President. by United States. President's Committee on Equal Employment Opportunity.